After playing the 2-2, Black will have at least three men still on the board and, at most, only one more turn with the dice. Because Black has to roll a double on the next turn to win, he must prepare now to give himself as many winning doubles as possible. The first step in playing the 2-2 correctly is to bear off as many men as possible. With three of the 2's, Black bears off men from the 2 and 4-points. The second step is to choose the correct man to move with the fourth 2, and in this case each of Black's three possible choices produces a different number of winning doubles. Black has one more 2 to play. The best choice is 2/off, 4/off, 5/3 (Play A), moving the man on the 5-point to produce four winning doubles: 3-3, 4-4, 5-5, and 6-6. The worst choice is moving the man on the 3-point (Play B), because both 3-3 and 4-4 are eleminated as winning rolls. In between is moving the man on the 6-point (Play C). This move eliminates 3-3 but not 4-4. If Black is familiar with end-game positions or takes the time to analyze the situation, he will make the right play. However, near the end of a close, exciting race, it can be very difficult to patiently examine all possible moves and then accurately count the number of winning doubles for each. To help in this situation, the author has devised a shortcut method of finding the play that maximizes the number of winning doubles when there are exactly three men left in a player's home board. The key factor is the location of the second highest (middle) man of the remaining three. The best place for this man is the 2-point, followed by the 3-point and then in order, the 4, 5, 6, and 1-points. To verify this preference order (2, 3, 4, 5, 6, 1), look at Black's three possible plays with the 2-2. After each play, the three remaining men wind up on the following points: A (3, 3, 6), B (1, 5, 6), and C (3, 4, 5). Therefore the middle man in each case is A (3), B (5), and C (4). According to the preference order the choices are, from best to worst: A, C, Bthe correct ranking as previously determined. In case of a tie, break the tie by applying the preference order to the highest man. For example, if Black rolled 3-3 instead of 2-2, he would bear off men from the 3 and 6 points, leaving a fourth 3 to play. Black to play a 3. 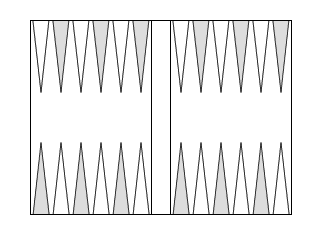 Completing the roll leaves the remaining men in two possible arrangements: A (1, 2, 5) and B (2, 2, 4). But in each case, the second highest man is on the 2-point. Applying the preference order to the highest man breaks the tie in favor of Play B, a choice that can be verified by noting that only B allows double 2's to win next turn. If a player's lead is large enough that he is likely to have at least two more chances to roll, the preference order may not apply. Sometimes a different arrangement is better for protecting the lead. Dr. Jeff Ward, a former professor of geology, has written several books on backgammon, notably The Doubling Cube. He is also head of the Backgammon Special Interest Group of MENSA.